The bad barcode dialog in the web client tries to display bad_barcode.png in the images directory. However, there is no bad_barcode.png image in that directory, so an empty image displays. We'll either need to move the bad_barcode image to the images directory or, if it's located somewhere else, change the link in the bad barcode dialog. This copies the existing bad_barcode.png file to web/images and also makes a few tweaks to the text and style of the dialog box. Attaching a screenshot of the reworked dialog box. I tested this with a 7/18/2017 version of master. 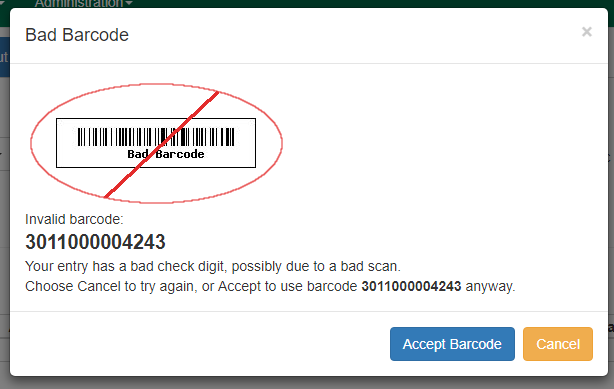 The bad barcode image now shows up when I test in checkout and check-in with the strict barcode box checked. When I try to test in Item Status I find that there is no strict barcode checkbox so I cannot trigger the popup. I think that is a separate issue though. Pushed to master and rel_2_12. Thanks, Michele and Josh!